This week's header image is from co-administrator Michelle Hryvnak Davies and shows the Hotel Sterling in Wilkes-Barre mid-demolition this past weekend. I wrote "In the distance, obscured by the Eagle on the right, is the once-proud Hotel Sterling - currently slated for demolition, I believe." Shortly thereafter someone left this comment: "Super pics. One correction, the Hotel Sterling is not going to be demolished. 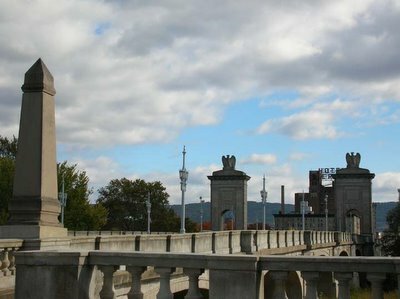 There is a plan to renovate it as part of the riverfront project." The person who left this comment called himself Gort. I think this was the first time I had a comment from him, and I followed the link on his name back to his profile, and then to his blog, Gort42. 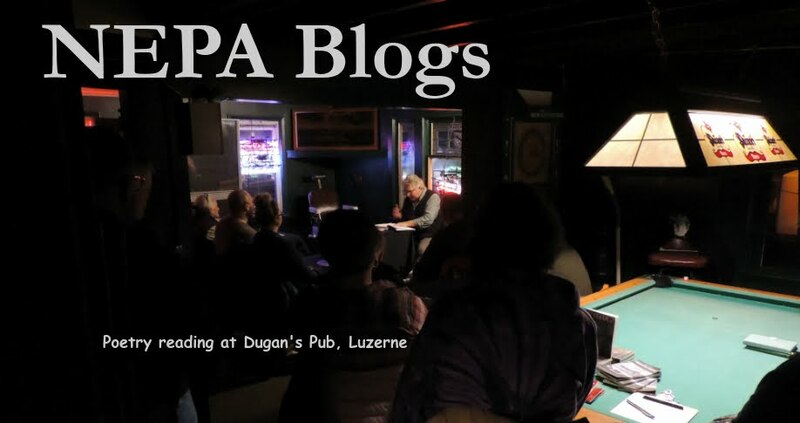 I quickly learned that he was one of the leading political bloggers in Northeastern Pennsylvania, and was networked together with many other political bloggers throughout NEPA and beyond. Months later, when I had the idea for creating a local blog network, I realized that Gort had already gathered together links to many local political blogs. All I had to do was go to his site and steal them. Then I decided that this would be far too much work, and it would be easier to ask him to join as co-administrator - and add the political blogs himself. It turned out, in the long run, that both of us were wrong. While the Sterling may not have been slated for demolition in October 2005, the plans to incorporate it into the riverfront project fell through. As of this writing, the Hotel Sterling is nothing but a pile of rubble waiting to be carted away. Some major artifacts from it were removed and preserved, and thanks to some intrepid photographers (see the end of this post) the now-vanished views from within the Sterling have been recorded for posterity. NEPA Blogs has actually featured the Hotel Sterling numerous times in its header images. Here are some (but probably not all) of them. You should also definitely download a copy of local guerrilla historian, urban archaeologist, and photographer Cheri Sundra's e-book, Welcome to the Zombie Hotel Sterling. 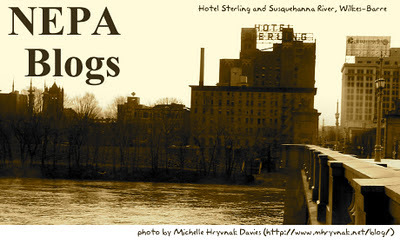 Abandoned and rotting away along the banks of the mighty Susquehanna River, the zombified Hotel Sterling tells its tale of fading grandeur and woe to an urban explorer who infiltrates the deteriorating structure, seeking to photographically document the reality of the condition of the building, as the hotel waits for its beloved community to decide its fate, once and for all. It's free through August 3 - Cheri doesn't want anyone to think that she's looking to make a quick buck from the destruction of this historic building. 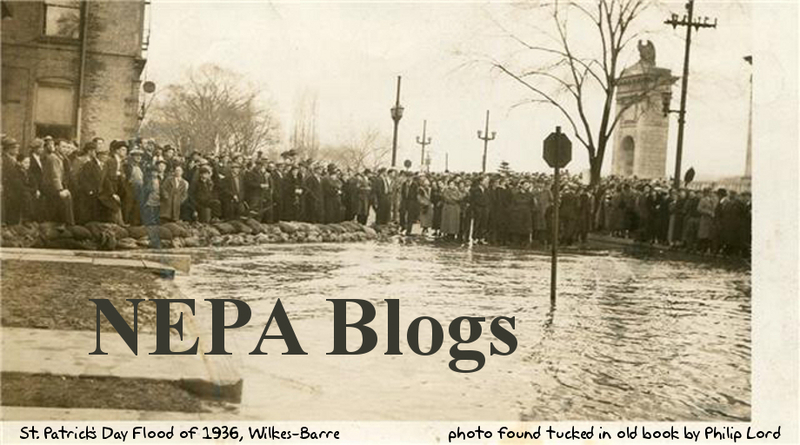 Submit you photos to be featured as the NEPA Blogs header! Send them to nepablogs@gmail.com. Our PA Live! Blog of the Week this week is Satellite News (http://www.mst3kinfo.com/). Don't be misled by the title of this week's Blog of the Week. It's not a blog with news about satellites, or a blog that delivers news by satellite. No, it's just about one satellite in particular...the Satellite of Love, home of Joel (later Mike) and the 'bots! If you have no idea what this is about you missed out on a fun part of the 1990's. From 1989 through 1999 viewers tuned in every week to Mystery Science Theater 3000 (MST3K to fans) to watch as the hapless maintenance man Joel (later Mike) and his robot friends were forced to watch cheesy movies ("the worst we can find") by Joel(later Mike)'s sadistic Mad Scientist bosses. The movies were laughably bad, chosen from the 1950's all the way to the early 1980's, but what made the show great was the running commentary supplied by Joel (later Mike) and the 'bots. NEPA resident Chris Cornell and Brian Henry have been running Satellite News in one form or another since at least September 2000. Their blog features episode reviews, news about what everyone's up to now, and historical tidbits about the people who starred in and made the movies that made up Mystery Science Theater 3000. For fans of MST3K, Satellite News is a smorgasbord of information, while for the uninitiated...well, it gives you something to come back to after your first exposure to the show. (Try the episodes featuring "Pod People" or "Torgo"!) 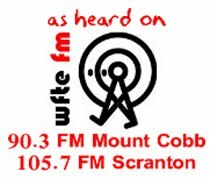 MST3K is a show with a national and world-wide fanbase, and it's fantastic to know that the definitive blog for the show's fans is generated right here in Northeastern Pennsylvania! Dale Culp from "Dale Rides His Bike" started a new blog recently called "bikeNEPA". As I'm sure you could figure out by the title, the blog is all about biking in Northeast PA. He's trying to draw more attention to the sport and mode of transportation and wanted us to give it a mention. Biking is for everyone. Biking isn’t just for the rich; it’s not just for the poor, either. It’s not a middle-class thing, it’s not a “white” thing, and you definitely don’t need to be wearing spandex shorts just to do it. Biking is for everyone. It’s a sport, it’s a mode of transportation — it’s a lifestyle. Our mission is to make bicycling safer for everyone — safer for cyclists, pedestrians and, yes, car/truck/bus drivers as well. Biking is for everyone, really. This is a community site dedicated to biking in NEPA. Whether you do it in the streets or prefer the trails of North-East Pennsylvania, we have you covered. Biking in NEPA is great, but it carries its share of risks, as well. We always encourage the use of proper safety equipment and strict adherence to the rules of the road and local laws for your municipality. Likewise, we encourage all cyclists in NEPA to contact local lawmakers when it comes to getting better infrastructure — such as segregated bike paths, better lane indicators and increased awareness of cycling in NEPA. Get involved! There are a LOT of us out there, we can make the streets better for everyone! We’re here to inform and educate, but we’re here to have fun, too. This site will have plenty of information on upcoming cycling events in NEPA. Group rides, charity rides and other events that involve cycling. Just visit the Events page for more information. Looking for a local bike shop? We have a page dedicated to locating a shop near you. Go local! Support small businesses who need your help and can provide MUCH better service than a big box chain department store. When it comes to things like proper fit, quality parts and service, don’t trust the “*mart” stores to worry too much about your safety. Count on a local mechanic to fix your ride up the right way. Visit the Bike Shops page for more information. bikeNEPA is here for everyone, and we mean it when we say “everyone” because biking is for everyone. Spread the word about bikeNEPA community blog and don't forget to follow them on Twitter and Facebook too! We received this message earlier this week from a reporter at the Pocono Record Newspaper. I’m a reporter here at the Pocono Record who also handles digital matters. We have some great recurring blogs by local folks that I was hoping you could pick up and add to your site. One focuses on running, the other on weddings and another on Pike County. Let me know if you need any more information. Michael Sadowski also had a popular blog at the Pocono Record called "Pop Rox" which has recently slipped into our 3+-Months-since-last-update blogroll. This blog fell to the wayside after he left the newspaper and area (he and his wife appear to be working from the Harrisburg area now). Hopefully, these new blogs will fill the void that Michael left behind. This was message board was originally linked to on October 23, 2011 by Gort, but I'm reposting it again. Bob Quarteroni: I had a blog site for a while but shut it down when it got to be nothing but flames and insults. It focused on NEPA media. I just saw that nepamedia proboards has been shut down. Add that to the fact that Joe Butkiewicz was ousted/quit at the TL today and I have a personal thing going with him, I'm going to restart it. Unfortunately, Bob doesn't know the different between a message board/forum and a "blog site". He's running a message board...not a blog site. 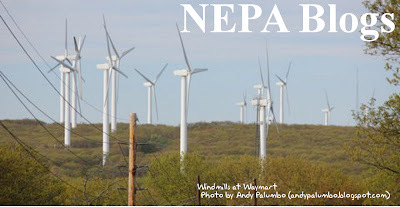 At any rate, in light of the NEPA Media boards being shut down, I figured this would be worth mentioning....again. I've been watching this site for several years and it's never gone anywhere. Maybe now it will finally take off. Good luck and happy flaming. Play nice kids. Northeastern Pennsylvania abounds with natural beauty. The header image for the week of July 24 - 30 Is an image from Ricketts Glen State Park and was taken by Nicole Karr of Springhouse Shop and Studio (http://www.springhousewoodshop.com/blog). Have you gotten photos from someplace beautiful in NEPA this summer? If you have, please send them to us at nepablogs@gmail.com and we'll use them as the NEPA Blogs header sometime soon! Our PA Live! 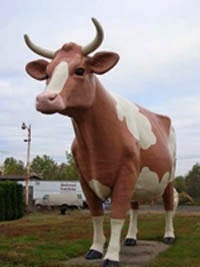 Blog of the Week this week is the Indraloka Animal Sanctuary Blog (http://indralokaanimalsanctuary.wordpress.com/). Indraloka Animal Sanctuary is based on a thirty acre farm in Mehoopany and is home to more than one hundred and fifty animals who would otherwise be euthanized or slaughtered. Since February 2011 the Indraloka Animal Sanctuary Blog has told the stories of those animals: heartbreaking stories, inspiring stories, stories that will fill you with joy, stories that will bring you to tears. Many of the stories are accompanied by achingly beautiful pictures of the animals who call Indraloka home, pictures just as moving and powerful as the stories they illustrate. Indraloka has a web presence beyond its blog, including a more traditional website and a Facebook page. But I believe the blog format serves an incredibly valuable function, by providing a space where the stories of the Indraloka Animal Sanctuary and its inhabitants can be told in the way they deserve to be, with long, lyrical passages and plenty of images. Check out the Indraloka Animal Sanctuary Blog, and prepare to be deeply moved.. In the NEPA Blogs header for July 17 through July 23, 2013, poet and playwright K.K. 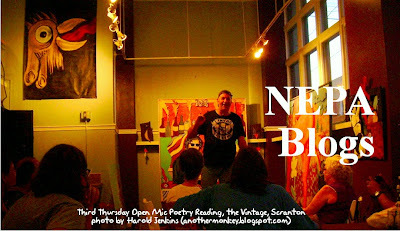 Gordon makes a point during the June 2013 edition of the Third Thursday Open Mic Poetry Night, held the third Thursday of every month at The Vintage, 326 Spruce Street in Scranton and presented by the Northeastern Pennsylvania Writers' Collective, with poetry starting at 8:30 PM. Admission is free and all are welcome to present their original works. Sign-ups begin at 8:00 PM. The next edition of this event takes place Thursday, July 18, so if you miss it you'll have to wait until August 15! The original (and extremely dark) photo was taken by me, and brightened up by Michelle Hryvnak Davies. Some blogs are about a single topic. Some are about many things. Jared A. Conti's The Oracular Beard definitely falls into the second category. Since July 2011 Jared has been presenting a mixture of poetry, book reviews, and music reviews, among other things. Jared is working on a post-apocalyptic graphic novel set in his home base of Lock Haven, so many of his reviews are of post-apocalyptic literature. It looks like some of the ideas for this story may occasionally find their way onto the pages of The Oracular Beard. If you're interested in poetry, music, or literature of the post-apocalyptic variety, or just would like to get a glimpse of the inner workings of a creative mind, be sure to pay a visit to The Oracular Beard! 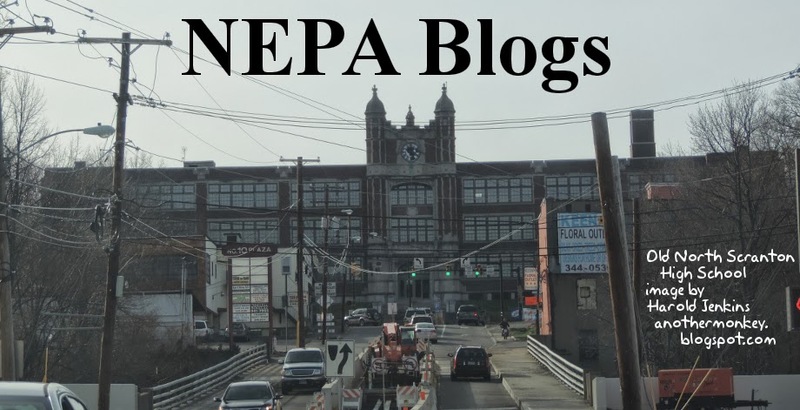 With the recent news of the LAG Towing contract suspension, Mayor Leighton stating crime in Wilkes-Barre city is down, and the soon-to-be demolition of the Hotel Sterling, there has been a ton of political blogs that have popped up. I believe that I've located these blogs in the comments sections of various articles on the local newspaper websites. This one has been around for awhile...but it looks like Gort was debating on adding it. Speaking of Gort, where are ya buddy? Come back. We miss you and hope everything is ok. 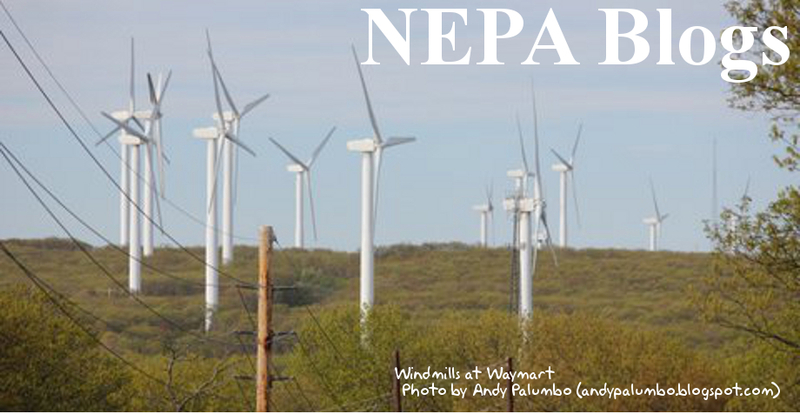 The header image for the week of July 10 - 16, 2013 is a shot of windmills at Waymart, taken by Andy Palumbo (andypalumbo.blogspot.com.) During the month of June a slightly different crop of this image served as the header image for Andy's own blog. He talks about the windmills and shares another image of them on this post. 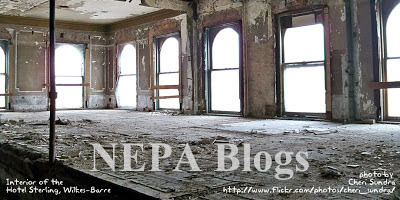 If you have an image you'd like to see featured as the NEPA Blogs header for a week, send it to us at nepablogs@gmail.com. Our PA Live! 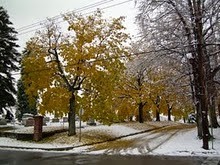 Blog of the Week this week is La Cascina (http://oldtiogafarm.wordpress.com/). La Cascina is the journal of Old Tioga Farm, located in Stillwater in Luzerne County. On that property Justin and Dillon Naylor operate a farm-to-table restaurant in the tradition of Italy, in a stone farmhouse that dates to 1831. While the blog, which has been publishing since September 2010, provides extensive information about the restaurant, it also provides plenty of background material about the guiding principles of and attitude towards food that are so important in making Old Tioga Farm much more than a simple farmhouse restaurant. The posts on La Cascina reflect the old-world charm of the farm and restaurant. The Naylors will even share the occasional recipe! Seating at the restaurant at Old Tioga Farm is extremely limited. Reservations are required and must be made months in advance of any planned visit. But you don't need a reservation to visit the blog La Cascina, which is open year-round! If you're someone who enjoys artisan-crafted food made and served in the finest traditions of the Italian countryside, Old Tioga Farm is definitely worth a visit - and so is La Cascina. 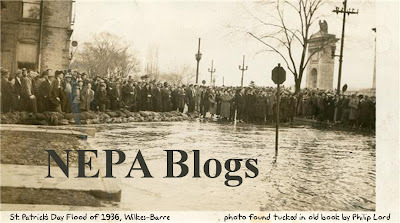 The NEPA Blogs header for July 3 through July 9 is a patriotic image of a parade in Montrose. The image was submitted by Leni Konstas of whiskeybacon.com. Leni also designed the header itself! 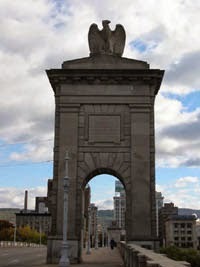 This week not only includes the July 4th holiday, but also marks the 235th anniversary of the Battle of Wyoming, which took place July 3, 1778, in which a ragtag collection of old men, young boys, and others fought against a superior force of Tories and their Iroquois allies in what is now Exeter. They fought to defend the settlements of the Wyoming Valley, which provided critical supplies for the Continental Army and was at the time the northwestern frontier of the colonies. The Wyoming Monument stands in tribute to their sacrifice. Enjoy your holiday, and remember what it stands for! If you have an image you'd like to see used as the NEPA Blogs header, send it to us at nepablogs@gmail.com. Alicia Magda loves to run. Her blog, Runningful, is all about running: every aspect of it, the wonderfulness of it - its name is actually a combination of "Running" and "wonderful," which gives you some idea how she feels about it. She has been blogging about running since March 2012, and has extensive experience in the sport, having taken part in 5k runs, half-marathons, and other running events. In Runningful Alicia tries to communicate the wonderful aspects of running for both experienced runners and people who are interested in getting into running but haven't started yet. She shares tips for runners, product reviews, and personal experiences. Whether you're an experienced runner, a novice just getting into the sport, or are simply curious about what's involved, Runningful has something for you. Check it out! Here's a blog I came across completely by accident. 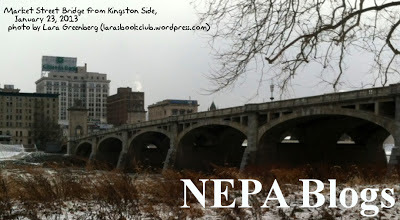 It's a blog about crating in NEPA, with links to lots of crafting resources in NEPA! This blog has been around since November of 2012, but that's about all I can find out about it. They also have a Facebook site, so I think I'll let them know they've been added!